Travel can take many forms. Whether it’s across continents or just across town, there’s nothing like a trip to refresh you, excite you, and open your mind. For me, there’s no trip better than the summer road trip. Perhaps it’s from reading books like Blue Highways and Walden on Wheels, but there’s just something about a summer road trip that excites me. The freedom, the endless possibility, the new sights–these are part of any good trip, but I find them especially present when I get behind the wheel and set off on the sunny open road. Even if you don’t share my nostalgic, romantic notions about road trips, there are still many good reasons to take one. Break up your normal routine. Explore places you might want to live after graduation. Experiment with a location independent lifestyle while still in college. Summer road trips are especially good because you have more time than you would during the semester. Last summer, I did a five day solo road trip across four U.S. states, and this summer I’m planning a trip to Washington, D.C., with two of my friends. I’m no expert, but I have learned a thing or two in the course of my trips. That’s why in today’s post I’m going to show you how to plan and execute a summer road trip of your own. You’ll learn how to pick a destination, plan your route, how to budget, and dozens of other essential tips. Disclaimer: While I have traveled a bit in Europe via bus, bike, and plane, my road trip experience is limited to the United States. I have tried, wherever possible, to keep my tips general enough to applicable to other countries, but some of the advice is inevitably U.S. specific. For any readers who have experience road tripping in countries outside of the U.S., I would love to hear about your experiences in the comments. Let me start by saying that you don’t have to travel far to have an awesome road trip. Sure, a cross-country trip can be an unforgettable experience, but it can also be expensive, unpleasant, and exhausting. You can make a great road trip out of driving to another city in your state or county. Farther != better. With that said, where you go is really up to your personal preferences. My travels in the U.S., for instance, are largely driven at the moment by my goal to set foot in all 50 U.S. states before I turn 25 (for anyone curious, you can check my progress here). I made my most recent trip to Mississippi, Louisiana, and Arkansas so that I could finally say I had set foot in every state that borders Tennessee (there are eight, if you were curious). But that same trip also incorporated my interests in literature (visiting William Faulkner’s home in Oxford, MS), food (sampling gumbo in New Orleans, LA), and the outdoors (camping in the St. Francis National Forest in Arkansas). The point is, I recommend that you base your trips around things that actually interest you, rather than “must-see” destinations or popular tourist activities. You’ll save money and have more fun. Finally, I also recommend that you get off the “beaten path.” If you travel only to the major cities in a place, you’re likely to miss out on a lot of cool sites. And the same thing applies within cities as well. Try to branch out from the tourist areas and go where the locals hang out. Especially with the help of the Internet, this is fairly easy to figure out. With GPS and mobile phone technology at the point that they are, you technically don’t need to plan your route in advance. You could get by with just a list of cities/places of interest. While this can make for a…spontaneous trip, I don’t recommend it. You can keep costs down if you do a little planning in advance. Plus it’s fun (though maybe I’m just weird). I usually start with Google Maps. If you want, you can just put in the destinations and have Google plot your route. This works fine if you have a single starting and ending point, but it doesn’t work so well for multiple stops. That’s why to plot longer trips, I use Google’s My Maps. My Maps allows you to create and save routes with up to seven destinations. Once you have the route, I recommend you generate step-by-step directions, take screenshots of them, and save the screenshots to your phone. This will save you phone battery and mobile data from having your navigation app open the entire trip. Particularly with longer trips, you’ll find that much of the directions consist of things like “Stay on I-65 for 100 miles.” Assuming you can read road signs, you probably don’t need an app constantly open to tell you this. As an extra precaution, I also print out the directions in case my phone breaks/dies. Another thing to consider when planning your trip is who, if anyone, you’ll be taking along. I’ve done road trips solo and with friends, and both have their merits. You have no restrictions on your departure times. You can go wherever you like. You have no one to push you to step outside of your comfort zone or try new things. Dining in restaurants alone can be awkward. Friends and family may give you weird looks when you say you’re traveling alone. You have someone to talk to on the drive. You have someone to share the driving responsibilities. You have someone to push you to try new things. Going to bars, especially, is less awkward. You have someone to reminisce about your trip with later. It’s easy to get on each other’s nerves after a while. Arguments about car music selection are likely. You don’t have complete control over your time. You don’t have complete control over where you go. You’re less likely to talk to new people. Overall, both are great ways to travel, and I recommend trying both. If you haven’t taken one, though, I especially recommend a solo trip. College is an opportunity to take one while you still (more than likely) have minimal family/work responsibilities. I’ll cover how to get the best deals on each in a moment, but a good place to start (especially for things like food) is to just Google something such as “daily food cost for [NAME OF CITY]”. In practice, this result could be a bit higher or lower than the actual number, but it will give you a starting place for budgeting. Estimate the costs for each item, tally them up, and then add between 10-15% to account for things you’ve probably forgotten (this is similar to the fudge ratio). You now know approximately how much your trip will cost. This is a good general procedure to keep money available for traveling. I use Capital One 360 for this, since they allow you to have basically an unlimited number of savings accounts with custom names/savings goals, but you can use whatever banking system you like. With the general procedure for estimating costs covered, let’s get into the specific principal trip costs…and how to save money on each. For the purposes of this article, I’ve assumed that you’re driving. Train/bus travel is also worth investigating (especially if you’re outside of the U.S.), but in my experience driving has been the most cost effective method of transportation. Plus it gives you the freedom to take as many breaks as you like, keep your own pace, and stop when you see something interesting. Lastly, watch out for toll roads. There are some routes where they’re basically unavoidable, but Google Maps will usually warn you if your route contains them, as well as suggest alternate routes to avoid them. A lot of my friends seem to perceive accommodation as being way more expensive than it actually is. I think this perception is a holdover from our parents’ generation, from a time when hotels were your only option. Things have changed, however, and today I would recommend that you stay in a hotel only as a last resort. Nowadays, hotels are the worst accommodation you could choose as a student traveler. They’re expensive, and the ones in student budgets are lacking in character at best and downright disgusting at worst. Instead, I recommend either Airbnb or hostels (in that order). For those of you haven’t used it, Airbnb is a site that allows people to rent out rooms in their homes to guests. The places range from very basic bedrooms to lavish tropical villas, but in almost all cases the places you’ll find on Airbnb will be cheaper and nicer than any hotel you could afford. Your host will also likely be able to recommend restaurants, attractions, and generally give you a local’s perspective. Also, in case you were concerned, Airbnb is very safe. The site background checks all its hosts and guests, and you can read reviews of your potential accommodation to make sure it is safe and clean. I’ve used it half a dozen times now and never had any problems. And as I mentioned, be sure to look into hostels as well. While not very common in the U.S. outside of major cities, they can also be very affordable and provide the chance to interact with other travelers. Finally, I’ll suggest on other possible form of “accommodation”: camping. There’s a bit of upfront cost for the gear, but once you have it you can stay in many parts of the U.S. (and other countries, I imagine) for little to no cost. Of course, camping isn’t for everyone, but it can make for an exciting, unconventional trip experience. Food costs can kill your budget if you’re not careful, so it’s important to budget for them accordingly. What you spend on food will vary depending on the type and quality you prefer, but in general, I recommend budgeting more than you think. In particular, when I budget for food I assume I’ll be eating out a few times. It’s easy to tell yourself you’ll be super strict and live only on granola bars and peanut butter, but you’re probably deluding yourself. Better to plan for a few nice(ish) meals than to blow your budget and end up broke/regretful. Personally, I tend to eat super cheap breakfasts and lunches (granola bars, sandwiches, fruit, etc.) and splurge a bit on dinner, but it’s up to you. Just whatever you do, avoid stupid tourist restaurants. Pretty much every city has some place that will claim to serve “Authentic Local Cuisine” with the aim of ripping off clueless tourists. Just do a bit of Internet research in advance or ask a local (your Airbnb host, for instance). You’ll end up eating better and cheaper. Finally, it can sometimes be worth checking out sites such as Groupon to find local restaurant deals (especially useful if you’re traveling with a group), and always make sure to ask about student discounts or deals. Public park in Vienna where I wandered around for a couple hours. Personally, I’m not that big into “attractions.” Of course, there are some things that I won’t visit a city without seeing/doing (couldn’t visit Amsterdam without seeing the Rijksmuseum, for example), but in general I prefer to do things I’m actually interested in over the “must-do” activities in a given place. In particular, I prefer experiences over things. The only souvenirs I tend to buy are books. I love bookstores, and whenever I visit a new city I make a point of visiting a few local booksellers. Besides that, I may spend money on the odd museum visit, but most of the things I enjoy doing while traveling are free. For instance, one of my favorite parts of New Orleans was spending several hours walking around the city park and public sculpture garden. Cost me nothing but my time, and I got some light exercise and sunshine in as a bonus. Of course, if the things you enjoy doing cost money, then by all means spend the money. But don’t discount how fun it can be to simply wander around the city for a few hours. You’re likely to get an experience that no guidebook or official tour could ever give you. Despite how the media may portray it, travel is not dangerous. Of course, there are rare cases of bad things happening, but you shouldn’t let those stories discourage you from traveling. Be aware of your surroundings. Pickpockets in particular are looking for people that aren’t paying attention. If you look vigilant, you’re less likely to be targeted. Don’t flash large amounts of cash. Again, this makes you look like like a target. Carry your wallet in either your front pocket or (if you’re not wearing something with sufficient pockets), somewhere close to your body and difficult to reach. Don’t act like a tourist. In particular, don’t stand in one place staring at a map. If you need to consult a map, duck into a coffee shop or store. Don’t pick up hitchhikers, and don’t hitchhike yourself. There are plenty of exciting stories of people traveling the U.S. by hitchhiking, but you can still have a very exciting trip without getting into random strangers’ vehicles. Avoid poorly lit, isolated areas at night, and research any cities you plan to visit for places to avoid at night/in general. Even more than proper planning, the key to having an excellent trip is having the right mindset. When you’re traveling, things are bound to go wrong, and having the right mindset will make sure that you view those “unfortunate” moments as part of the adventure. Be open to the unexpected–be open to adventure. You can’t control everything about how a trip will go, so don’t try to. Above all, be a traveler, not a tourist. The tourist is fixated on having their trip align with how they imagined it; the traveler embraces and celebrates the trip for what it is. GasBuddy Trip Cost Calculator – Input your start and end destinations to get an estimated fuel cost. 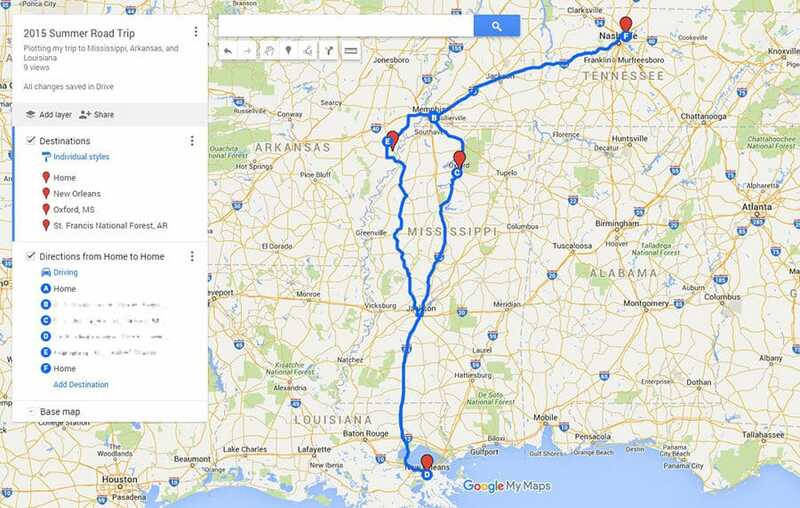 Google’s My Maps – For planning trips with multiple destinations. Maps.me – A free maps app based on public domain maps and user contributions. Just download the map for your country/region, and you can navigate without an Internet connection. Airbnb – Affordable, interesting accommodations with locals. Hostel World – Book and compare prices for hostels. Wikitravel – A good starting point for learning more about basically any destination in the world. How I Traveled to Japan on the Cheap – In Episode 62 of the College Info Geek Podcast, Thomas uses his travels to Japan as a case study for traveling cheaply. Contains useful advice for any trip. I hope that you now feel prepared to plan and execute your own road trip. Have you ever taken a road trip? Have any tips? Share your experience and advice in the comments or in the CIG Community.